NEW YORK (AP) -Chris Drury faces overtime the same way he handles the first minute of a game. That could explain why he seems to be in the right place at the most crucial times. Drury scored a power-play goal 1:46 into overtime, giving the New York Rangers a 2-1 victory over Pittsburgh on Monday night. Drury has scored in overtime four times and has notched 44 NHL game-winners, including seven this season - his first with the Rangers. "His positioning is as good a compliment as anyone can pay because he is really good at that," Rangers coach Tom Renney said. Even the praise he receives is understated, and that is how Drury likes it. He is always willing to answer questions, but never dwells on himself. "I never think of my game in that light," when asked why he shines when the pressure is greatest. "I just play my same game. Just go hard every shift." The Rangers were given the advantage in the opening minute of the extra session when Sergei Gonchar held Jaromir Jagr as the New York captain drove to the net. Pittsburgh is still in prime position to win the Atlantic Division, leading New Jersey by seven points. The Penguins, with 100 points, are two ahead of Montreal in the race for the top seed in the Eastern Conference. They have two games remaining, Montreal has three, and New Jersey holds four. "We would have liked to (clinched)," captain Sidney Crosby said. "We are now one point away. It's tight hockey from here on in." New York, eliminated from the division race Sunday when they lost the opener of the home-and-home series in Pittsburgh, jumped to fifth in the East - one point ahead of the Ottawa Senators. They are tied in points with the fourth-place New Jersey Devils, but are behind because they have two fewer wins. The Rangers and Devils will close the regular season Sunday in New Jersey. New York's magic number to lock up a postseason berth is two points - any combination of two gained or lost by ninth-place Washington. "I am not thinking about the home-ice advantage right now. I am thinking about making it," said Henrik Lundqvist, who made 21 saves. "We have been winning and taking points, but we are still close to the ninth spot." Drury pushed the Rangers to the brink of wrapping up a playoff spot for the third straight year with his 24th goal of the season. Jagr staked New York to a 1-0 lead in the second period with another man-advantage goal, but the Penguins tied it midway through the third when Maxime Talbot scored. New York went to overtime for the eighth time in 14 games and improved to 4-3-2 over its last nine. 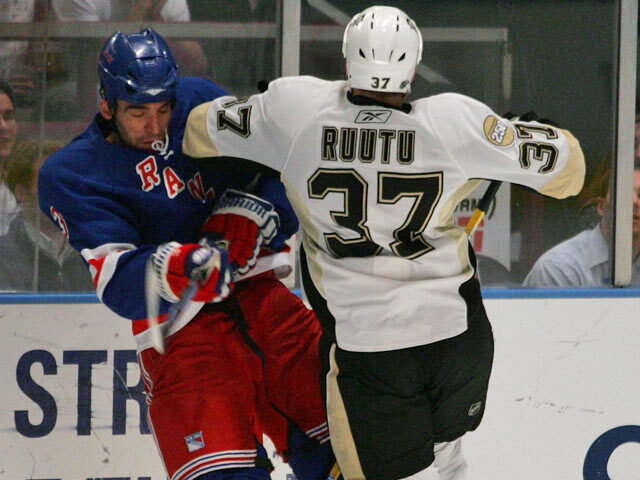 The Rangers won five of eight from Pittsburgh during the season series, including all four at Madison Square Garden. They took this one despite losing forward Brendan Shanahan to a lower-body injury in the second period. Renney called Shanahan day-to-day and said the injury is a "muscle issue" that doesn't appear to be serious. Talbot tied it 1-1 with 9:57 left in regulation, taking a pass from Ryan Malone - who fed him with a pretty pass after blowing by defenseman Michal Rozsival. Talbot scored the final goal in the last minute of Pittsburgh's 3-1 win over the Rangers on Sunday. It took nearly 32 minutes of game time and a lengthy review to break this scoreless deadlock. Given a 5-on-3 power play after simultaneous penalties to Ryan Whitney and Jeff Taffe, the Rangers took advantage with some more help from the Penguins. "On the 5-on-3, we watched the video. We can't find the penalty," Penguins coach Michel Therrien said. "I don't know where it came from." Jagr fired a shot that bounced high in the air off Marc-Andre Fleury and tantalizingly fell toward a crowd in front. Scott Gomez patiently waited for the puck to drop below the height of the crossbar and swung to meet it with his stick. Before he could make contact, Pittsburgh defenseman Rob Scuderi batted the puck with his glove, bouncing it into the net off Fleury's mask and back. Jagr was given credit at 11:43 for his 21st goal of the season, but just No. 5 on the power play. New York had a 1-0 lead and 17-4 edge on the shot clock. He has scored three times in five games after netting three in the previous 24. Notes: The Penguins had four periods this season in which they recorded two shots, the most recent coming against the Rangers in the second on Jan. 14. ... Crosby played on back-to-back days for the first time since his initial return from a high ankle sprain on March 24. He missed 28 of 31 games before coming back again last Thursday against the New York Islanders. ... Jagr had gone 32 games since his previous power-play goal, also against Pittsburgh on Jan. 14. This marked the first one he scored at home.